Our flagship 10-day Mini-MBA: Strategic Management Programme offers a broad, cross-functional approach to general management. The programme enables participants to acquire a broad, cross-functional approach to general management. The programme starts with an e-learning module on COMPETITION that participants take at their own pace before the classroom sessions start. This is followed by four in-class modules - MARKETING, FINANCE, STRATEGY, LEADERSHIP. The modules present both general management principles and the most recent theoretical developments. They explore real situations faced by the participants in their own business environments. Participants leave the programme with an improved skill set and fresh ideas for approaching critical business issues. Professor John Branch teaches marketing and international business courses at the undergraduate, MBA, and executive levels at the Stephen M. Ross School of Business at the University of Michigan (USA). He has also served as Director of Educational Outreach at the University’s William Davidson Institute, which focuses on business in emerging economies. Professor Branch has also served as an adjunct or visiting professor at more than 40 business schools throughout world and was a visiting scholar at Queen Elizabeth House of the University of Oxford and at the J. L. Kellogg Graduate School of Management of Northwestern University. He has conducted management training in numerous international companies, including British American Tobacco, British Telecom, Mercedes Benz, Oracle, Coca-Cola, Michelin, Ericsson, and Nestlé. 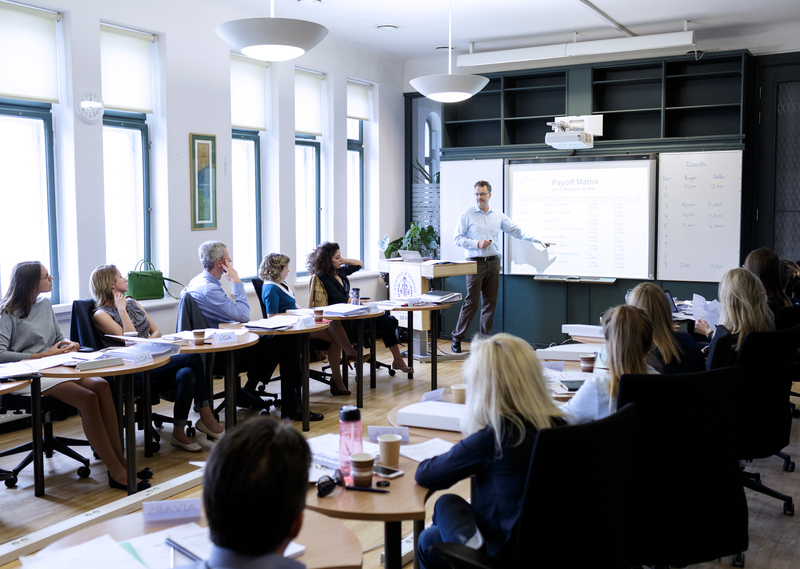 Professor Anete Pajuste teaches finance and accounting courses at the undergraduate and executive levels at the Stockholm School of Economics in Riga. She holds a PhD in Finance from the Stockholm School of Economics (Sweden) and has spent a year as a visiting research fellow at Harvard University. Her articles have appeared in several journals including the Journal of Corporate Finance, the Oxford Review of Economic Policy, and the Journal of Banking and Finance. She is a research member of the European Corporate Governance Institute (ECGI). Professor Pajuste has been teaching for 18 years at the undergraduate, MBA and executive education level, and has an extensive experience and training in participant centered learning methods such as cases and experiential learning. In parallel waith her academic work, Professor Pajuste serves as a consultant on firm valuation, cost accounting, investment management and financial planning issues and shares her practical knowledge from investing in equities, index funds and real estate. Professor Yusaf H. Akbar teaches Management at Central European University Business School in Vienna, Austria. His main teaching interests are in Strategy, International Trade and Investment. He has taught at universities and business schools all over the world, including Queen’s University, Canada; Thunderbird Graduate School of International Management; Barcelona Management Institute, ISEG Paris and the Hult University, USA. Dr. Akbar’s has published two books and has been published in peer-reviewed journals including the Journal of World Business, Business and Politics, Global Governance, Thunderbird International Business Review, and World Competition. He received his Ph.D. at the Sussex European Institute, University of Sussex, UK. Professor Peter Boumgarden is Associate Professor of Management at Hope College, Lecturer in Strategy at the Ross School of Business at the University of Michigan, and Faculty Affiliate at the William Davidson Institute at the University of Michigan. Professor Boumgarden researches, consults, and facilitates executive education in the private and non-profit sectors, where helps leaders define and implement sustainably differentiating strategies, helps organizations develop processes for learning and innovation, and explores the role of leadership, teams and organizational values in shaping decisions. His past clients include Herman Miller, Edward Jones, Charles Schwab, Oracle, Bunge Global, CCA Global, Shape Corporation, Monsanto, BBVA, UniCredit, & Enterprise Rent-A-Car, amongst others. Professor Boumgarden completed his PhD in Strategy and Organizations at Washington University in St. Louis (USA). The Strategic Management Programme enables participants to acquire a broad, cross-functional approach to general management. Participants leave the programme with an improved skill set and fresh ideas for approaching critical business issues. Upon completion of the programme, participants receive Strategic Management Programme certificates issued by the William Davidson Institute and the Stockholm School of Economics in Riga. • Give participants an on-going professional network of peers. The Strategic Management Programme is designed for executives with five or more years of management experience. Participants come from a wide variety of organisations and typically are responsible for establishing policy at corporate or divisional levels. Participants should be familiar with basic business functions and ready to adopt new perspectives on these functions. Instruction is in English and participants should be sufficiently fluent in order to contribute to classroom discussions and group work. The Strategic Management Programme features five modules, structured around an integrative strategic framework. The programme starts with an e-learning module on Competition that participants take at their own pace before the classroom sessions start. This is followed by four in-class modules. The modules present both general management principles and the most recent theoretical developments. They explore real situations faced by the participants in their own business environments. The modules combine lectures, discussions, cases, exercises, and other learning activities. Participants also conduct group work which enhances their critical thinking, decision making, and teamwork skills. They can look forward to acquiring skills in 5 key areas. Each participant will receive access to this module before arriving for the programme.